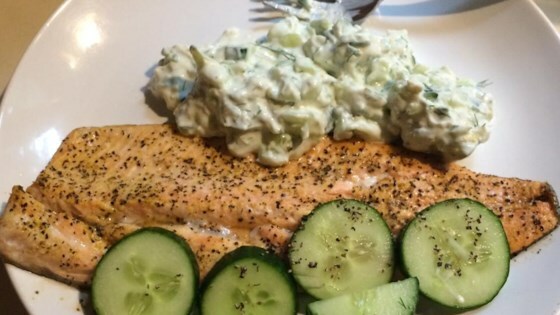 "Tender and mild trout with a tangy yogurt sauce. Serve with crusty bread and lemon potatoes. If you can, use freshly caught trout." 'Interesting flavor'; quite tangy. Was okay; had lots of leftover sauce as we only used sparingly. Everybody loved it. Even my 3 and 5 year old. There was a ton of sauce. You could probably get away with halfing the sauce. I made this for my family with a sidedish of grilled winter squash topped with blue cheese and roasted red peppers. They loved it. They thought the fish came out moist with crispy skin. This is a terrific light meal. It will be perfect in the summer - quick, easy and very good. This is a fantastic, light and tasty dish!